Help is on the way! What a sigh of relief that gives the Christian who can bodly say, “The Lord is my helper, and I will not fear what man shall do unto me.” (Heb 13:6). I think this is good news-don’t you? I know these are difficult times, you look at the mess you are in and all you feel is alone, bewildered or perplexed constantly thinking, “Where did I go wrong?” There is guilt for past sins and bad decisions and you feel alone or like you are being punished. There are some reading this article that are staring at some insurmountable problem that is testing the very heart of their faith in God. Others have to deal with the perfunctory day-to-day issues eating away at their souls. But God who does not sleep or slumber will preserve your soul from evil and you go about your daily life. Your, “help cometh from the LORD, which made heaven and earth.” (Ps 121:2). What is worse is other people you trusted and depended on are not there. “My friends and companions avoid me because of my wounds; my neighbors stay far away.” (Ps 38:11NIV). Some people just become cold and aloof to others who have issues. You were there for them, prayed for them and wept with them but now they are nowhere to be found. People do not know what to say, they do not know what to do for you, so they stay away. Sometimes people become vicious toward us. “They rewarded me evil for good to the spoiling of my soul.” (Ps 35:12). It is pretty sick the way we human beings treat each other especially when people pay others back with evil instead of good. There are people who are just envious and miserable and they love company. They are jaded, thinking everyone has some hidden hypocrisy and when bad things happen they see it as God’s disfavor. Notice what the scripture says, “they do it to the spoiling of our souls.” They seem to rob our faith and plunder our victory, maliciously waiting to see your failure. This is not paranoia, but it seems since they can’t attack God they use you for target practice. David has people saying about him, “There is no help for him in God.” (Ps. 3:2). They look and say, “Wow they have really blown it this time, even their God will not rescue them out of this mess.” The deep dark trials that some Christians have endured have made others think God has left them. In the time of trial, weakness our brothers and sisters need help not condemnation and accusation. But help is on the way!!! “How much more will God, who is the Father of such dispositions in his creature, stir up his whole strength to defend his children? ‘He said, They are my people, so he became their Saviour,’ Isa. 63:8. As if God had said, Shall I sit still with my hand in my bosom, while my own people are thus misused before my face? I cannot bear it. The mother as she sits in her house hears one shriek, and knowing the voice, cries out, ‘O it is my child.’ Away she throws all, and runs to him. Thus God takes the alarm of his children’s cry: ‘I heard Ephraim bemoaning himself, saith the Lord;’ his cry pierced his ear, and his ear affected his bowels, and his bowels called up his power to the rescue of him.” He is more present than the difficulty, closer than the pain of a broken heart and nearer to the one who is distressed and wounded. Help is on the way! When will God help his church? “God will help her right early.” (Ps. 46:5). He will be the early! What a promise! “Make no tarrying Oh my God.” (Ps 40:7). You may lie down with tears on your face but the sun will open your eyes with joy. He has heard your cry, “Help me LORD! I am needy, broken and hurting!” Yes, help us Lord early! We need your help! “My voice shalt thou hear in the morning, O LORD; in the morning will I direct my prayer unto thee, and will look up! (Ps 5:3). This darkness will pass and morning will break with glorious light! Like Spurgeon says, “As soon as the first ray of light proclaims the coming day, at the turning of the morning God’s right arm shall be outstretched for his people.” Amen and amen. This is the day that the Lord has made and in a time of salvation he is helping you! Notice a time of trouble is seen as a time of salvation in the scriptures. It is trials savings time! Like the first light of the dawn rushes over the horizon may the Spirit of God help us. Help is on the way! My wife and I were in a large church in New Jersey looking at a giant mural of Peter and Christ in the famous walking on the water story. In fact, the caption under the picture said, “Come and walk on the water with me.” But both my wife and I saw it differently. We remembered what the scripture said of Peter said, at that moment when he yelled, “Lord save me!” Oh dear christian although he invites you to walk on the water, it is safe to say, you may not do it perfectly. There are times you will feel the water coming upon you up to your face and all you can do is cry for help! 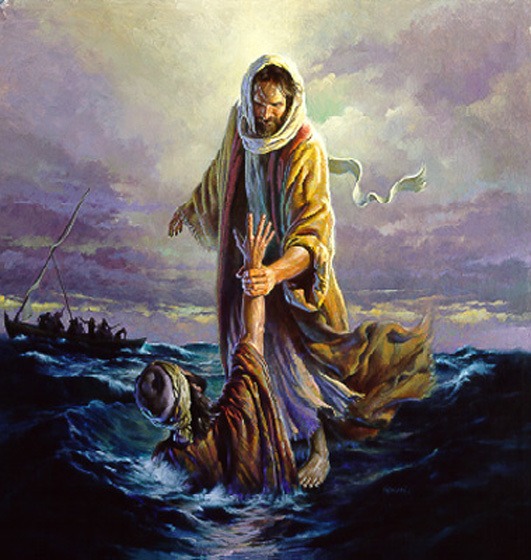 Yes you must have faith that His help can uphold you, but on the other hand if you falter you shall not drown either. THIS IS THE LORD WE ARE TALKING ABOUT! The mighty Savior, the God of the armies of the heavens. This is the One who, “gave to the sea his decree, that the waters should not pass his commandment…” (Prov 8:29). He will help! You will not drown. You have one of his exceeding great and precious promises: Thus says the Lord in Isaiah 43:2: “When thou passest through the waters, I will be with thee; and through the rivers, they shall not overflow thee…” Help is on the way! Don’t be afraid, I know your anxiety beats your heart like a drum in your ears, your brow is furrowed with confusion and your body trembles with fear, but can you even at this moment feel the strength of the nail scarred hand of Christ grab your hand and as you “look and live” you will see the most tender loving eyes of Jesus ask you, “Wherefore didst thou doubt?” Don’t feel condemned. He must ask this question. Your doubts will melt away as he shows you how ridiculous your fears were as the Lord Jesus escorts you through the raging sea of trouble. See how big, how wonderful, how powerful Jesus our Master really is! He is not bringing you back to safety for HE is your safety as much on the water as in the boat or on the shore. The sinewy arm of the carpenter of Nazareth is no other than the Lord who has made bare his arm in the sight of all the nations and he will save. Your help in his righteousness not your own! “Deliver me out of the mire, and let me not sink: let me be delivered from them that hate me, and out of the deep waters.” (Ps 69: 14). Help is on the way! He saves you as though you and he were on dry ground. The water, “under his feet as it were a paved work of a sapphire stone.” (Ex 24:10). What once almost drowned you becomes a place that you walk on. People will be amazed and some even ashamed because of the invisible power of Christ upholds you. It becomes like a precious jewel. The time of trial is like refining gold in fire (1 Pet 1:7) and becomes a priceless time of learning and sparkles with God’s glory and presence. Heavenly Jerusalem’s streets are, “pure gold, as it were transparent glass.” (Rev 21:21). What should have made you sink now is a firm foundation beneath your feet. It should also be noted that it is “paved with love.” (Song 3:10). You will find that what you thought were bitter steps was actually God was leading you in his love closer to him! Every step you took in the trial was ordered by the Lord and lined with his affection for you. What people saw as God’s abandonment has now made a major turn around. Do not doubt. Do not be afraid! Help is on the way! We must note finally that man was in extreme sin, radically depraved. “How much more abominable and filthy is man, which drinketh iniquity like water.” (Job 15:16). Men and women are described as the wicked who are like “the troubled sea, when it cannot rest, whose waters cast up mire and dirt. ” (Isa 57:20). All people are “without strength” (Rom. 5:6) and the sinner is helpless to save himself. The Bible says, “God was in Christ” and he became his people’s very present, extreme help! There he stepped out in front of Pilate’s ” judgment seat in a place that is called the Pavement, but in the Hebrew, Gabbatha.” (John 19:13). Before Golgotha there was Gabbatha. There in the ocean of man’s criminal acts and God’s wrath against sinners, he stepped out on the waters and walked God’s justice like no other could all the way to Calvary. There his steps were paved with an everlasting love and there on the Cross with a superhuman strength he stretched out those same arms that saved Peter and gathered his elect people in salvation to himself. Through the gospel he calls them from death to life. There he says I will “uphold thee with the right hand of my righteousness. For I the LORD thy God will hold thy right hand, saying unto thee, Fear not; I will help thee!” (Isa. 41:10, 13). Only God by his grace can help us. He is he only One who can rescue us from the danger of dying in our sins. I was sinking deep in sin, far from the peaceful shore, very deeply stained within, sinking to rise no more. But the Master of the sea, heard my despairing cry, from the waters lifted me, now safe am I…Souls in danger look above, Jesus completely saves, He will lift you by His love, out of the angry waves. He’s the Master of the sea, billows His will obey, He your Savior wants to be, be saved today. Love lifted me! Love lifted me! When nothing else could help Love lifted me!